Any interested group of citizens in a county can create a zone. It is a democratic process. If 60% of the residents in an area want to create the zone, it can be brought forward to the County Commission. The rules of the zone must be drafted to be consistent with the county growth plan. Each landowner who supports the district needs to sign a petition. The signature must match exactly the name on the title of the land. When more than 60% of the landowners in the district have signed the petition, it can be brought to the County Commission. After the County Commission receives the petitions, it holds a public meeting to determine whether the zone is in the “public interest and convenience.” If so, the district is established. If the zone is established it is referred to a county planning and zoning commission. This is a seven member oversight board that reviews the zoning petition and recommends how it should be implemented. After opportunities for public input, the planning and zoning commission puts in place the regulations for the district. The planning and zoning commission is responsible for the ongoing administration of the district. There is still much work to be done before the Silvertip Zone becomes a reality. The County will publish an “intent to create the district,” which gives any landowners within the Silvertip Zone 30 days to protest to the Commissioners. Several residents appeared at the meeting and indicated a desire to protest. However, according to attorneys representing the Silvertip Zone, such protests are not allowed by Montana law. 68% of the landowners within the Silvertip Zone signed the petition to create the Zone. Click to read full letter. More to come on this. I’ll post the video of the meeting, which went on for about two and a half hours, as soon as it is uploaded. 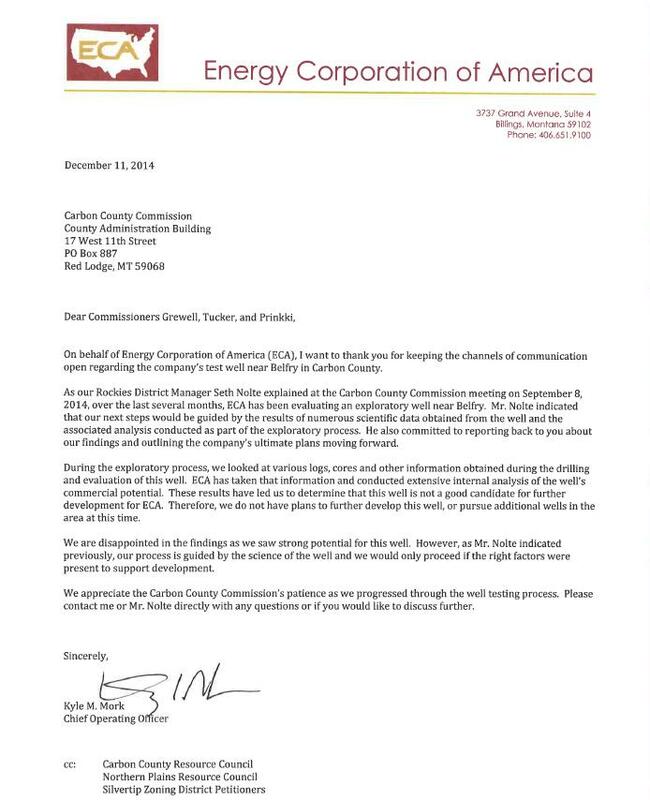 This entry was posted in Community Organization and tagged Carbon County Commissioners, citizen initiated zoning, Energy Corporation of America, Silvertip zone. Bookmark the permalink. this is great news for Carbon County. Congratulations to the county commissioners who made a reasoned decision despite pressure from ECA. It is time that the citizens have a say in energy development. Just a say, not veto power. And congratulations to Bonnie Martinell for heroic work in leading this effort. The xone in Stillwater County is still in process. It will be a larger zone than the one in Carbon County, so there are many more signatures to gather. Expect the zone to come before the Stillwater Commissioners in the next few months.